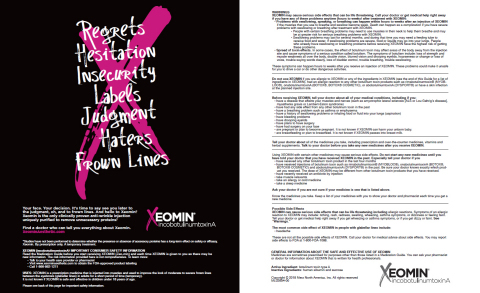 RALEIGH, N.C.--(BUSINESS WIRE)-- Merz Americas announced today the launch of a new advertising campaign for XEOMIN® (incobotulinumtoxinA) called “Later Haters,” which calls for women to “X out” judgment, stop apologizing for caring about how they look and put an end to feeling guilty about their self-care routines. XEOMIN is the latest botulinum toxin type A approved by the U.S. Food and Drug Administration (FDA) to temporarily improve the look of moderate to severe frown lines between the eyebrows (glabellar lines) in adults. Taking a unique approach to market research, Merz connected with women during their most honest and open moments by talking with groups of girlfriends. In the course of these intimate conversations, these women revealed how they want to embrace their self-confidence and make choices about looking and feeling their best without guilt or judgment. For more information about XEOMIN, please visit www.xeominaesthetic.com. XEOMIN® (incobotulinumtoxinA) is the latest botulinum toxin type A approved by the U.S. Food and Drug Administration (FDA) to temporarily improve the look of moderate to severe frown lines between the eyebrows (glabellar lines) in adults. For more information, please visit www.xeominaesthetic.com. XEOMIN is a prescription medicine that is injected into muscles and used to improve the look of moderate to severe frown lines between the eyebrows (glabellar lines) in adults for a short period of time (temporary). Problems with swallowing, speaking, or breathing can happen within hours to weeks after an injection of XEOMIN if the muscles that you use to breathe and swallow become weak. Death can happen as a complication if you have severe problems with swallowing or breathing after treatment with XEOMIN. People with certain breathing problems may need to use muscles in their neck to help them breathe and may be at greater risk for serious breathing problems with XEOMIN. These symptoms can happen hours to weeks after you receive an injection of XEOMIN. These problems could make it unsafe for you to drive a car or do other dangerous activities. are breastfeeding or plan to breastfeed. It is not known if XEOMIN passes into breast milk. These are not all the possible side effects of XEOMIN. Call your doctor for medical advice about side effects. You may report side effects to FDA at 1-800-FDA-1088. Copyright © 2018 Merz North America, Inc. All rights reserved. MERZ, the MERZ logo and XEOMIN® are registered trademarks of Merz Pharma GmbH & Co. KGaA. BOTOX®, DYSPORT® and MYOBLOC® are registered trademarks of their respective owners.